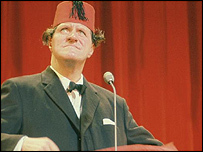 Tommy Cooper was born in Caerphilly, Wales on March 19, 1921. He was born 2 months prematurely and the doctors warned he might not make it through infancy, but he did survive and grew to be a impressive presence of 6” 4 inches. At the age of 8 an aunt bought Tommy a magic set and he would spend hours perfecting all the tricks. By the age of 16 he got a job as magician on a boat. His first performance was a diasaster. Due to stage fright all his tricks went wrong, people started laughing and he ran away in tears. However on reflection he realised that if he concentrated on making people laugh he could develop a very good routine. Soon after the outbreak of world war two Tommy Cooper joined the army and served for 7 years until 1947. For much of this time his regiment was posted to the Middle East. When opportunity allowed he worked on his performances as a failed magician. 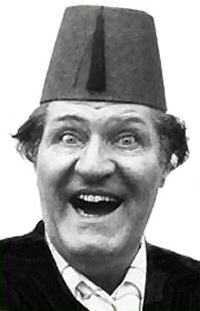 It was during his time in Cairo that Tommy Cooper got his trademark hat. – a middle eastern Fez. He was about to perform but realised he had lost his hat. Therefore he swiped a hat of a passing waiter and performed with that. It got a big laugh so he stuck with it becoming a trademark of Tommy Cooper. On leaving the army he decided to pursue a career in show business. By 1948 he had made his debut on TV, performing in the BBC programme, New to You. This led to a very successful TV career mostly with Thames television. For many years he had his own show as a stand up comedian. Later in his career he also performed with other comedians such as Erik Sykes. In addition to being a comedian Tommy Cooper was an expert magician and member of the Magician’s circle. Although an accomplished magician he mastered the art of often failing to complete his tricks for comic effect. Although many tricks would fail, he could also show that he was capable of performing magic tricks with a great degree of professionalism. The comic material of Tommy Cooper was nothing special, what made him one of Britain’s favourite comedians of the time was his intrinsically comic nature. He embodied great innocence and childlike qualities which made his failed jokes particularly funny. Many comedians have commended his ability to bring the house down with the thinnest of materials. Paul Daniels remembers Tommy Cooper giving an after dinner speech at a club in London.
" This great big man just stood up. That's all he did. He just stood up and the place was in absolute hysterics at a man standing up. Now, I don't care how much you study comedy, you can't define that, that ability to fill a room with laughter because you are emanating humour. After several minutes of laughter he turned to his wife and said, "I haven't said anything yet." And the whole place went up again." It was his style to often start laughing even before he had started to tell a joke. In a similar vein he would often walk on to the stage to start off with lines like. "Have we got time for more?" He had wonderful comic timing and relied on fairly simple family material. Tommy Cooper particularly liked plays on words and used to enjoy ironic twists in the meaning of words. Outside of TV Tommy Cooper was a great practical joker. At a memorable Royal Variety performance he even made a joke with the Queen. On being introduced to the Queen tommy Cooper asked the Queen. "No, but I might not be able to give you a full answer." "Can I have your Cup Final tickets?" He had a wonderfully inventive mind, with the ability to turn any situation to comic effect. One time he son was caught stealing something from Woolworths. On being brought home Tommy Cooper maintained an absolute silence. Eventually he pulled his son to one side and said in a very serious voice. “If you ever, ever steal again .... get me a packet of my favourite cigars." It was said his son never stole again. "He was the nicest, kindest - and most awkward - man in the world." Tommy Cooper died, perhaps appropriately, whilst in the middle of a live TV performance. It was on April 15, 1984, during a Royal variety performance when he collapsed from a massive heart attack halfway through his act. Initially people thought it was part of his act but it was soon realised he was genuinely ill. Despite attempts to revive him. He died later in hospital.